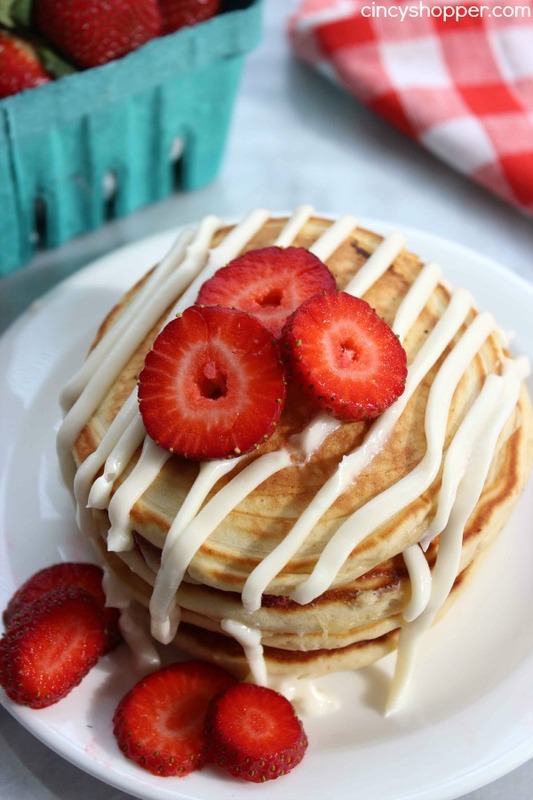 No need to rush to a fancy restaurant for breakfast when you can make these Super delish Strawberry Pancakes with Cream Cheese Glaze right at home. 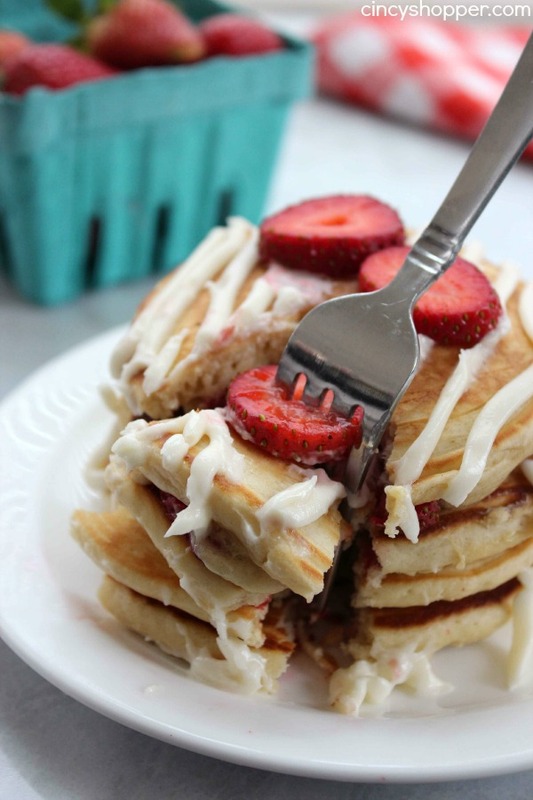 These pancakes are made with fresh strawberries and then topped with a sweet cream cheese glaze. Perfect for a wonderful weekend or even Valentine’s breakfast! My kiddos love hot breakfast on the weekends. Pancakes are one of their favorite breakfasts (or breakfast for dinner). I will quite often make Pancake Bacon Dippers for them to eat on their way to school. On the weekends they always look forward to me making them a special breakfast. 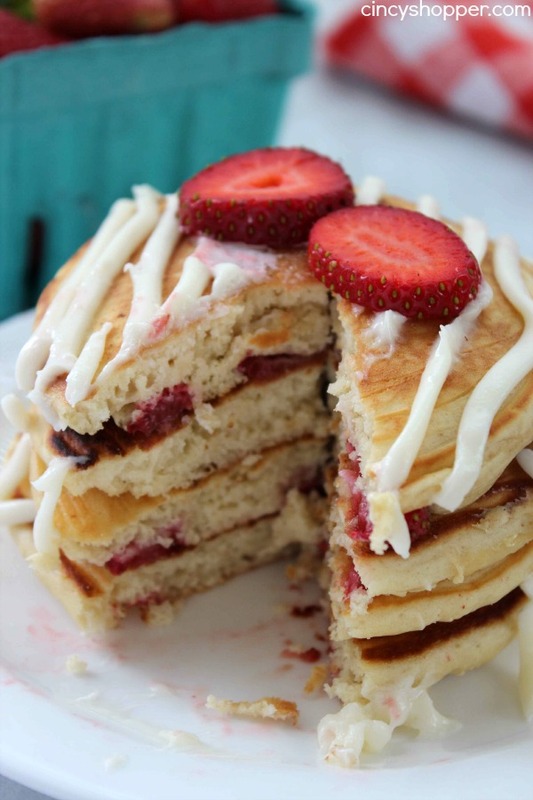 This past weekend I was not to pressed for time on Saturday morning so I whipped up these Strawberry Pancakes. I knew the boys would love them. I kicked them up a notch for my daughter with some Cream Cheese Glaze. OMG! Perfect topping for the pancakes. 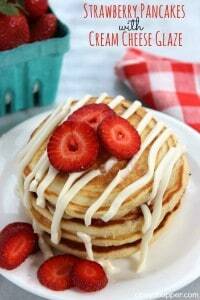 After making my first batch I realized that these Strawberry Pancakes and Cream Cheese Glaze will be perfect for Valentine’s Day Breakfast. Grab some fresh strawberries and a few pancake ingredients and you will have a stack of these Strawberry Pancakes with Cream Cheese glaze on your table in just a few minutes time. 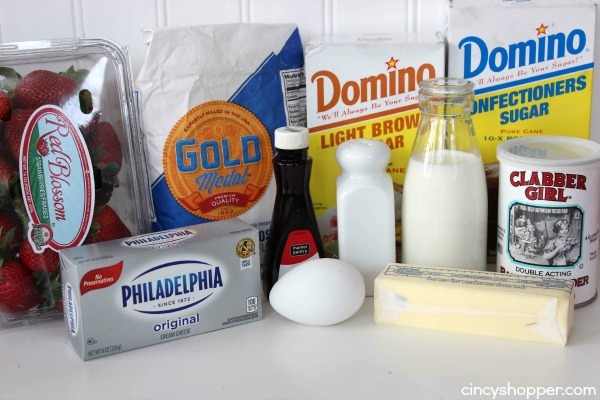 Combine glaze ingredients and beat until blended. Transfer to zippered bag or piping bag and refrigerate until redy to use. Heat a nonstick griddle or skillet over medium heat. Whisk together the flour, brown sugar, baking powder and salt. 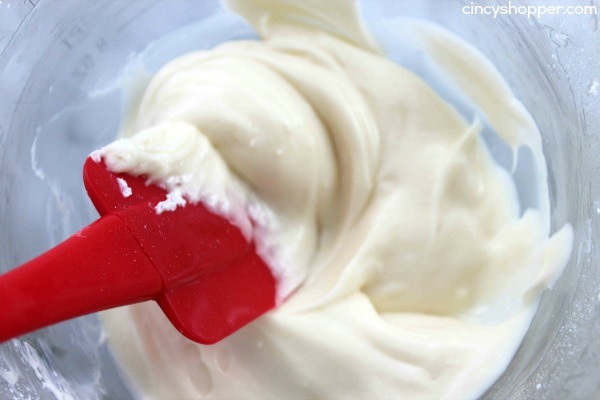 In a small bowl, whisk together the egg, milk and vanilla. 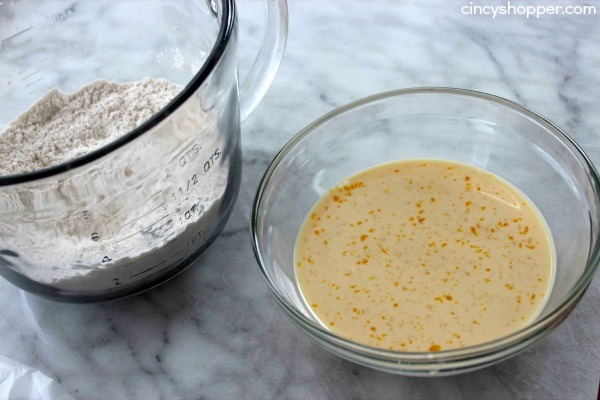 Whisk the wet ingredients into the dry ingredients, then stir in the melted butter. 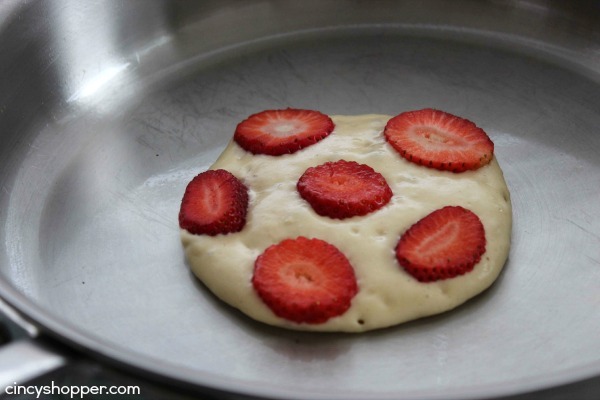 Pour 1/4 cup batter onto the griddle for each pancake. 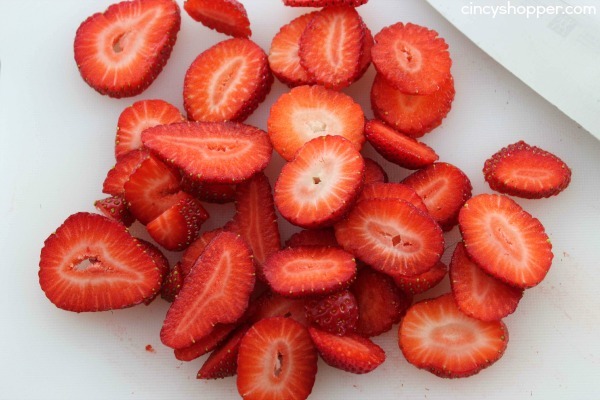 Then place several strawberry slices in each pancake. Cook until set and bubbles form in the middle, about 3 minutes. Flip and cook until golden brown, about 2 minutes. 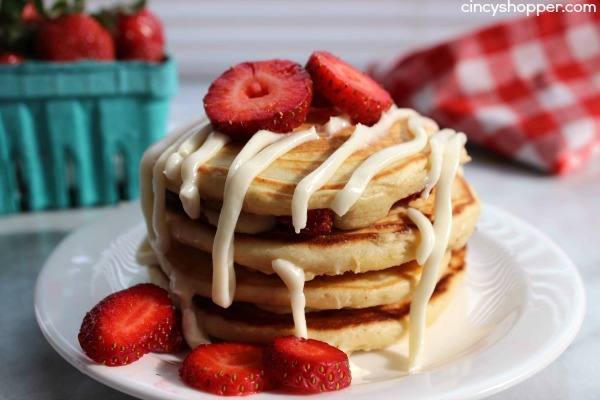 Drizzle Pancakes with glaze when serving. Cook set and bubles form in the middle, about 3 minutes.